Contact us today if you would like to review the Medicare Supplement Insurance plans that are available in Virginia. 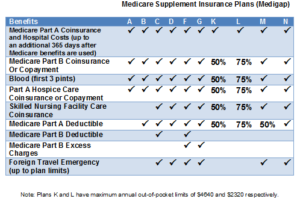 Our local licensed Richmond Virginia agents can explain Medicare supplement plans cost and deductibles, so you will have a better understanding of your plan choices. SMH Insurance is not a government agency. We are a Medicare Insurance broker agency and represent several insurance companies, which affords us the ability to find you the best Medicare premiums. Policies are guaranteed for life. Premiums are subject to change, but any change will apply to all members of your plan. You can see specialists without having to get a referral. There are no networks and you can see any doctor or hospital who accepts Medicare patients. Coverage is available in all states and covers you when traveling in the U.S. In Virginia, you are eligible to enroll in a Medicare Supplement Insurance policy once you have enrolled in Medicare Part A and Part B. A person can apply for a Medicare Supplement Insurance plan at anytime during the year. Although generally the best time to enroll in a Medicare Supplement insurance plan is during your open enrollment period. This is a one time period that starts automatically once you’re 65 or older and enrolled in Medicare Part B. During your open enrollment period you are guaranteed a Medicare Insurance policy. You cannot be denied coverage during this period due to a pre-existing health condition. The insurance company cannot charge you a higher premium or require underwriting. Please contact us today to schedule a face-to-face appointment or private phone call to review your Medicare Supplement Insurance options.